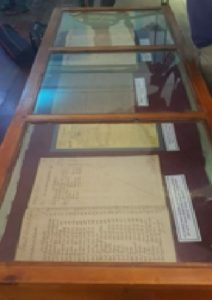 (The St. Christopher National Trust) February 20, 2018: The original, handwritten Act for the Abolition of Slavery – The Emancipation Act – is now on exhibit at the National Museum. 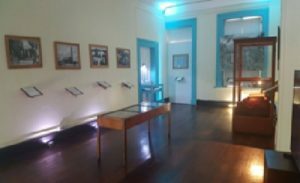 In keeping with the theme, the Archives agreed to collaborate with the National Trust to mount the exhibit, which looks at the first 100 years following Emancipation. On the 1st August 1834 enslaved people in the British Empire were legally freed when the Act for the Abolition of Slavery came into effect. The Act was passed in the British Parliament in 1833, to come into effect in 1834, however each colony was expected to work out the details locally. It was to be accompanied by a number of Acts on the duties of the special magistrates, the designations and duties of the apprentices and the responsibilities of the employers. In July 1834, St. Kitts became the first colony to pass adequate legislation to support the Act that was passed in England. In addition to the Act for the Abolition of Slavery, the Archives has provided digitized copies of the accompanying legislation that are available for viewing. “We are trying to explore the 19th century,” said Director of the National Archives Victoria O’Flaherty, speaking at the media event on Friday. “The whole purpose of this exhibition is to fill in some of the information that’s missing,” Mrs. O’Flaherty said. National Trust Patron the Governor General Sir S.W. Tapley Seaton GCMG, CVO, QC, JP speaking at the event, made a special appeal to the public to support the National Trust and its events. National Trust President Schneidman Warner endorsed his call for support. “The St. Christopher National Trust, continuing its mission of preserving our heritage and informing the people of this country of our heritage, appeals to everyone…to be as generous as you can, to be as forthcoming as you can,” Mr. Warner said. The “Emancipation Journey: The First 100 Years” Special Exhibit runs until Friday, March 16th. The Museum is offering a special weekend admission for nationals and residents. Admission to the Special Exhibit is $5.00 for nationals/residents and non-members pay an additional $5.00 general admission if they also wish to tour the museum itself. However on weekends the museum admission will be waived for those who visit the Special Exhibit. The Museum is open Monday – Friday from 8:00 a.m. – 4:00 p.m. and Saturdays and Sundays from 8:00 a.m. – 2:00 p.m.